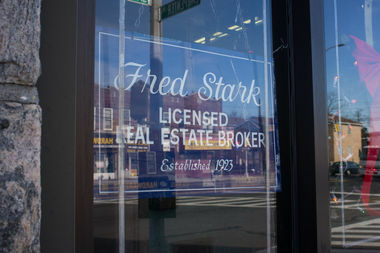 The officer of Fred Stark Realty on Jamaica Avenue in Hollis, where his daughter Rita Stark worked since taking over the properties. She was a maligned figure throughout Queens for neglecting her many properties. QUEENS — Rita Stark, the reclusive landlord reviled by Queens residents for notoriously thwarting efforts to develop her large portfolio of crumbling properties, died quietly this fall — leaving those properties to her brother and nephews, according to her will. There wasn’t much fanfare over her death, despite her being one of the most infamous landlords in Queens. She died Oct. 25, according to paperwork filed at Nassau County Surrogates Court and confirmed by an employee at the Hollis office Stark took over from her father, Fred. All of the workers at her Jamaica Avenue office declined to comment. Stark — once called the “landlord from hell” by a local newspaper — held properties in Jamaica, Hollis, Far Rockaway and throughout the city, which she took over after her father died in 1988. In her will, she left half of the properties to her brother Harold — who had sued her for control of the portfolio in the early 1990s — and the other half to his two sons, Fred and Alan, according to the documents. Harold Stark owns an industrial development company, whose office is a few doors down from Rita's. He did not respond to multiple requests for comment, and his sons could not be reached for comment. Rita Stark's lawyer also declined to comment, saying he would need permission from the estate to do so. Rita Stark also left more than $800,000 to 12 family members and friends — and appointed her longtime friend Elizabeth Farrell as the trustee of the estate, documents show. It remains unclear what Harold Stark's takeover means for the fate of her properties — including a $91 million revitalization plan for Far Rockaway that centers around one of her shopping centers. The Thriftway Shopping Center on Mott Avenue had for years been a sign of the neighborhood's declining downtown. Storefronts remained empty and she backed out of plans to sell or develop it over the years. It's at the center of the plan to boost the neighborhood with a mix of public and private development, which the city issued its first RFP for development of a city-owned lot in the area earlier this month. A spokesman for the Economic Development Corporation said they're still committed to the redevelopment and to "investing in Downtown Far Rockaway to create good jobs and much needed housing." "We're hopeful that whoever takes over management of these properties will share our commitment, and will help activate them in a way that benefits the community," spokesman Anthony Hogrebe said. It would be the first real change in the area for decades. Jonathan Gaska, the district manager for Community Board 14, said he’d received dozens of calls from people who wanted to develop or lease stores at Stark's shopping center. Many hoped development would spur much-needed economic growth in downtown Far Rockaway. But each time, Stark would renege on a deal, he said. Her legacy throughout Queens will be mixed, officials said. When he was growing up, Councilman Donovan Richards would walk by the abandoned Thriftway shopping center, which over the years became a symbol of the neighborhood’s decline — and he made it a priority to address it once in office. But Stark began to soften in recent years, say those who had dealings with her. Gaska said he’d only talked to her twice in his more than 30 years with the community board. When she called him for the final time two years ago, he was so surprised he thought it was a prank, he recalled. On that call she acknowledged a need for change, he said. They had a “10 minute pleasant conversation,” and she told the board she wanted to work with them. A Dunkin Donuts opened in the center last year — the first new store in years. Richards said he was also shocked to find when he first met Stark two years ago, she was far from the “Wicked Witch of the West” he had envisioned for so long. “I sort of expected this person to come in with the devil horns — but honestly, when she came in, she was this sweet lady, who had a beautiful smile, and who frankly really did start to get it,” he said. She didn’t want to be seen as an evil person, she told him. But he explained that, after so many years of neglect, how else should his constituents feel? “In my last conversation with her, she really was at a stage in her life where she wanted that reputation she had to not be the world’s view," he said. "She really cared, towards the end at least." If the Far Rockaway project goes as scheduled, major changes should be finished by 2019, Richards said. It would, he added, be a happy ending to Stark's convoluted history in Queens. "This is one part of her legacy that we should be proud of, and she would be proud of," he said.